Loizos Heracleous is a senior associate of Strategic Concepts International, Professor of Strategy at Warwick Business School, and Associate Fellow at Green Templeton College and the Said Business School at Oxford University. His previous roles include Reader in Strategy at the Said Business School and Official Fellow, member of the Executive Committee and member of the Governing Body of Templeton College at Oxford. He was also Associate Professor of Business Policy at the National University of Singapore, where he spent 7 years. Loizos is a member of the US Academy of Management, European Group for Organization Studies, Cambridge Alumni in Management and Singapore Institute of Directors. He has been listed in the Marquis Who's Who in the World since 2003. Loizos earned his Ph.D. at the Judge Institute of Management Studies, University of Cambridge. He is the author of Strategy and Organization: Realizing Strategic Management, (2003, Cambridge University Press); Business Strategy in Asia: A Casebook (2009, Cengage; with Kulwant Singh and Nitin Pangarkar); Discourse, Interpretation, Organization (2006, Cambridge University Press), Flying high in a competitive industry (2009, McGraw-Hill, with Jochen Wirtz and Nitin Pangarkar), and Practicing Strategy (2016, Sage, with Sotirios Paroutis and Duncan Angwin). Loizos serves on the editorial boards of several leading management journals, including the board of the top empirical journal in the world, the Academy of Management Journal. He served as Senior Editor of Organization Studies (2003-2006), and currently sits on its editorial board; and also sits on the editorial boards of Human Relations, the Journal of Applied Behavioral Science, the Journal of Management Studies, and the Asia Pacific Journal of Management. 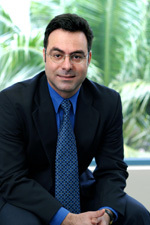 His research has been published in over 50 research papers in leading international journals, including the Academy of Management Journal, Academy of Management Review, Strategic Management Journal, MIS Quarterly, Harvard Business Review, MIT Sloan Management Review, Journal of Management Studies, Human Relations, and Journal of Applied Behavioral Science. The US Academy of Management has honored his research through three Best Paper Awards; in 1999 (on globalization), 2004 (on organization development), and 2006 (on corporate governance). His research on how biometric technologies can afford sustainable competitive advantage (in Managing Service Quarterly, 2006) has won the Emerald Highly Commended Paper Award for that year. In addition his work won 2 further awards from Emerald for research with the best practical implications. Heracleous, L. 2003. Strategy and Organisation: Realizing Strategic Management. Cambridge: Cambridge University Press. Pangarkar, N., Singh, K. and Heracleous, L. 2010. Business Strategy in Asia: A Casebook (3rd ed). Thomson Learning (accompanied by volume of instructional notes for all cases). Heracleous, L., Wirtz, J., and Pangarkar, N. 2009. Flying High in a Competitive Industry: Cost Effective Service Excellence at Singapore Airlines. McGraw-Hill. Heracleous, L. 2007. Are you aligned? Why mis-alignments persist and what can be done about it. Forthcoming, World Business. Jacobs, C. and Heracleous, L. 2007. Strategizing through playful design. Forthcoming, Journal of Business Strategy. Lan, L. and Heracleous, L. 2007. Negotiating the minefields of corporate vote-buying. Forthcoming, Corporate Governance: An International Review. Jacobs, C. and Heracleous, L. 2006. Constructing shared understanding - the role of embodied metaphors in organization development. Journal of Applied Behavioral Science, 24 (2): 207-226. Jacobs, C. and Heracleous, L. 2005. Answers for questions to come: Reflective dialogue as an enabler of strategic innovation. Journal of Organization Change Management, 18 (4): 338-352. Lan, L. L. & Heracleous, L. 2005. Shareholder votes for sale. Harvard Business Review, June, "Forethought" section: 20-24. Heracleous, L. and Lan, L. L. 2002. Who wants to be a competent director? An evaluation tool of directors' knowledge of governance principles and legal duties. Corporate Governance, 2 (4): 17-23. Heracleous, L. and Murray, J. 2001. The urge to merge in the Pharmaceutical industry. European Management Journal, 19 (3): 430-437. Heracleous, L. 1999. Boards of directors as leaders of the organization. Corporate Governance: An International Review, 7 (3): 256-265. Heracleous, L. 2001. Expert commentary on case study "The urge to merge in the Pharmaceutical industry". European Management Journal, 19 (3): 439. Heracleous, L. 2001. Review of Cohen, S. and Boyd, G., Eds., "Corporate governance and globalization", 2000, Edward Elgar. Asia Pacific Journal of Management, 18: 265-267. Heracleous, L. and Jacobs, C. 2007. Playing with serious intent: Creative strategy and leadership development. In Gallos, J. (Ed.) Business Leadership: A Reader. Jossey-Bass, forthcoming. Heracleous, L. and Fellenz, M. 2005. On the applicability of "alien" concepts to organizational analysis: Some criteria for inter-domain conceptual transfer. In Linstead, S. and Linstead, A. (Eds.) Thinking Organization. London and New York: Routledge: 97-111. Heracleous, L. 2004. The strategic role of the board of directors. Corporate Governance Executive, 2 (1), Corporate Governance and Financial Reporting Centre, National University of Singapore. Heracleous, L. 2002. Entrepreneurship initiatives at twenty leading universities. Report delivered to NUS Enterprise, National University of Singapore, July. Heracleous, L. 1998. Leadership: What do we know? Research report delivered to the Hay Group, Singapore, May. Heracleous, L. 1996. Developing the integrated consulting model: A report on the research evidence. Research report delivered to the Hay Group, UK, October.